The Bears playoff loss to the Green Bay Packers (OF ALL FOOTBALL TEAMS!) means it will be a long road back to owning anything resembling bragging rights. We will now have to drag the heavy ball-and-chain weight of shame and disappointment with us for what could be many, many years to come. We cannot even begin to fully comprehend the gravity of this loss just yet. Our world is now a different one. For starters, we will no longer be able to visit our Wisconsin neighbors to the north wearing anything Bears blue-and-orange. Sure, you could, but the Cheesehead ribbing you would have received in the past is mild in comparison to the flat-out chiding you will certainly get in this new, ugly, post-playoff world. What about that self-stick Chicago Bears emblem in the back of your SUV? Yeah, you’ll want to remove that too, prior to the next family trip to Lake Geneva, Door County, or the Wisconsin Dells. Do you really feel like schlepping along the Wisconsin interstate, seeing every other driver with that menacing “ha-ha you lost” sneer? I don’t. So what can be done about it? 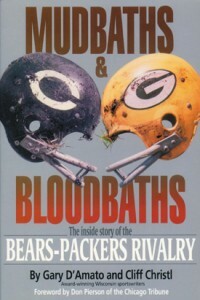 Is there any way to possibly sidestep or avoid the inevitable onslaught of Packer fan jeering that lies ahead? No. There is nothing that can be done. There is no conceivable comeback-line. There is no feasible “Yeah, but a least…” retort. Nothing. We have nothing to say. The only sure path to redemption for the Chicago Bears and their collective of fans alike, is a Bears win over the Packers in the Superbowl. Let’s hope, for all of our sakes, that this happens soon – next season soon.